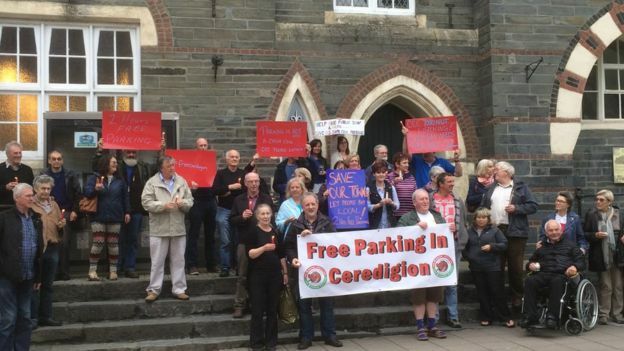 A protest has been held in a bid to secure free parking in a Ceredigion market town. Around 40 traders and shoppers marched through the centre of Cardigan on Wednesday calling for two hours of free parking for visitors. Local shops said their trade increased by up to 20% last year when parking machines in the town's four car parks were vandalised and out of use. Ceredigion council said parking charges must be "consistent" in all towns. The march was led by the chairman of Cardigan Traders, Martyn Radley, who has called on Ceredigion council to give local traders "a level playing field" with out-of-town businesses. 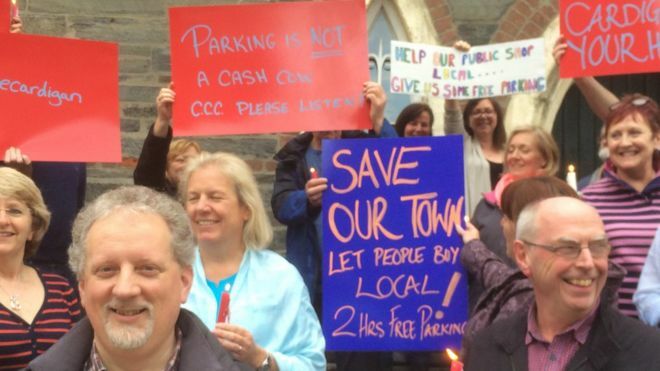 Ceredigion council said the matter had been discussed and the view is that "parking charges must be applied consistently across all towns within Ceredigion". The council added the charges are necessary both in terms of covering the cost of providing car parking facilities and helping to meet the "extraordinary financial pressures" facing the authority. Traders have vowed to continue their campaign for free parking. suspending its charges on the premise it will support local business? These examples are not so much proof, as admissions that many councils, businesses, ordinary citizens, and even politicians hold an honest belief that parking charges DO affect High Street footfall. Car parking changes could boost local business in some Lincolnshire towns. East Lindsey District Council has announced the new arrangements will come into effect this summer. The council's executive board has agreed a new car parking policy for the district, which aims to increase footfall on the high streets and encourage shoppers to stay for longer. The plans will be monitored over a 12-month trial period, during which time the council has committed to no overnight charges on any of its car parks. It is hoped to attract shoppers who can relax a little more when visiting towns within the district. The policy was developed following a review of car parking data, consultation with local people and visitors and discussions with town and parish councils. A statement said: "The newly approved policy moves away from the previous 'one size fits all' district-wide approach to car parking, and to a position where the car parking arrangements in each town reflect local trading conditions. "The policy recognises the importance of car parking income to fund services provided to residents by the district council." Alford – 30 minutes free ticketed parking in Market Square. Horncastle – 30 minutes free ticketed parking in Market Place. Louth – 30 minutes free ticketed parking in Market Place car park and reduced tariffs for stays of longer than two hours. Mablethorpe – greater choice of tariffs. Skegness – greater choice of tariffs and new trial of pay on exit machines on the Festival Car Park. Spilsby – one hour free ticketed parking on all Council owned car parks. Before the new arrangements can be introduced, the council must publish a formal notification for a period of 28 days. The council cannot yet confirm the precise date the changes will be implemented. Users of the council's car parks are asked to keep an eye on the information boards in the car parks for the latest information. Regular users of the council's car parks are also reminded that they can purchase car parking permits, which provide significant reductions on the regular car parking tariffs. St Helens Council on Merseyside has scrapped on- and off-street parking charges in the town centre on Saturdays for a year-long trial that aims to boost the struggling retail economy. The authority's deputy leader, Councillor Peter Wilkinson, said the move was a response to concerns over the cost of car parking in the town. He said: “There have been more complaints since North Yorkshire County Council introduced charges on the High Street and the suggested loss of trade as a result of this. Chester Race Company, who own the car park, said they agreed to the move after speaking to traders on Watergate Street. Chester Race Company CEO, Richard Thomas, said: “We continously liaise with retailers in the city centre on how the Race Company can assist the local retail economy. This decision was prompted by a request from the traders on Watergate Street and we are very happy to meet this request. Pay-in-advance parking has been scrapped in a town car park to try to boost the town's economy. Drivers using the Granby Street car park, in Loughborough, will now pay for how long they have stayed, rather than buying time in advance. Charnwood Borough Council said it wanted to prevent drivers getting fines for overstaying and to bring the set up into line with the multi-storey Beehive Lane car park. Jane Hunt, council cabinet member for regulatory services, said: "We are committed to helping the borough grow and prosper and this transformation has been designed after listening to our market traders, shopkeepers, Loughborough Business Improvement District (BID) and residents. METROPOLITAN councillors in Limerick have formally passed plans for free parking in the city centre in a bid to boost flagging trade. Wolverhampton - Kim Gilmour, operations director at WV One, said the cut to parking costs would encourage more people back into the city centre. Council chiefs say the ‘Free after Three’ initiative has been introduced to support town centre businesses and traders and give shoppers a little extra Christmas cheer. Cllr Hebb says “I was opposed to this land sale in the strongest possible sense, and now here we are fighting off car-parking charges which will cripple the Stanford community. “We will fight any car-parking charges which could negatively impact on our much loved shops”. Welcoming the move Cllr John Paul O'Shea said it would help provide a timely boost for the local economy. Private carpark owners have joined with the local authority to promote Christmas and New Year shopping in the city centre by reducing parking rates and making special offers. Businesses have urged a council to reduce parking charges in Egham town centre as they attempt to arrest a worrying dip in trade. “As much as I would love to be able to support our high street our council needs to help small businesses instead of driving potential clients away with extortionate parking charges and eager parking attendants." The spaces have been created thanks to Purley BID, which worked with Croydon South MP Chris Philp, local councillors and council officers who met to discuss the problems in September. Mr Cripps said: "This is a huge win for all the businesses and shoppers of Purley and could not have been achieved without the great collaboration of the business community, local politicians and the council themselves." But there is still more work to be done to improve parking in the town, Mr Philp added. "It's a strong step in the right direction," he said. "It's very clear that parking [problems] in and around the High Street and Brighton Road are damaging businesses." The three spaces near Sainsbury's have a one-hour maximum stay. The two spaces outside Boots have a single yellow line waiting restriction from 7am to 9am, Monday to Friday. "The initiative started as a trial last August but has proved so popular Hinckley and Bosworth Borough Council are keen to carry it on"
" There will be no car parking charges on Saturdays before Christmas at all Rochford District Council car parks. The usual fees will be waived on Saturday, December 19 to help support businesses and residents to shop locally." He says he was completely unaware of the initiative, which took place on the weekends leading up to Christmas in a bid to boost trade. Denbighshire County Council, Denbigh Business Group and Denbigh Town Council are working closely together to slash the price of parking in Denbigh. The decision has been made to amend parking charges in the busiest two shoppers’ car parks to support small businesses in the local area after listening to their concerns. Councillor David Smith, Cabinet Leader for the Public Realm, explained: “Over the past few weeks, Denbighshire County Council and Denbigh Town Council have been working closely together to monitor the impact of the parking charge increase. "Having looked at the particular circumstances in Denbigh, we were able to make some changes and the Town Council have also stepped in to subsidise a further reduction in parking charges. As part of this joint working, we are doing our best to support local businesses and have listened to their concerns. “We have identified a number of improvements to parking within the Town Centre which are, firstly, the creation of 9 free parking spaces within Factory Ward Car Park. These spaces will be monitored by the enforcement team and will consist of 7 standard spaces and 2 disabled spaces. There is a maximum stay of 1 hour for the standard spaces and 2 hours for the disabled spaces to encourage turnover and thus increase the availability of the spaces for visitors to the Town. Parking charges in Factory Ward car park will be amended to long stay rates with reduced charges of £1.50 for 3 hours and an all-day parking cost of £3.50. The current 30 minute and 1 hour tariffs will remain the same at 30p for 30 minutes, £1.00 for 1 hour. Permit holders will continue to be able to use their permits to park in the Multi Storey car park opposite Factory Ward. On the 1st September, Parking charges in Vale Street car park will have a new subsidised rate of £1 for 2 hours, this change is being subsidised by Denbigh Town Council. The changes in tariff will come into effect from 1st September at the Factory Ward Car Park and Vale Street Car Park. The creation of 9 free parking spaces within the Factory Ward Car Park is effective immediately. Council chiefs have been forced to slash charges at a multi-million pound car park – because not enough drivers are using it. THE Prime Minister has said that parking charges in market town’s like Chippenham or Melksham should be made easier to boost trade. Mr Cameron was speaking in response to Chippenham MP Michelle Donelan's first question at Prime Minister's Questions yesterday. Ms Donelan did need a little bit of help from speaker John Bercow who had to call for order after Ms Donelan was interrupted after blaming declining market town high streets on "years of Labour neglect". The Conservative MP asked what support Prime Minister David Cameron could offer the market towns of Chippenham, Melksham, Corsham and Bradford on Avon. In response, Mr Cameron said: “I do know her constituency well and spent a lot of time there with her before the election. “What I would say to her is that the offer of devolution is not limited to cities, we’re just as open to proposals from towns, counties and districts.